Mr. Richards is a member of the firm's Litigation and Alternative Dispute Resolution sections. He counsels individuals and business entities on litigation-related risks and represents clients in commercial litigation and alternative methods of dispute resolution related to large and small commercial cases, intellectual property and general civil matters. Mr. Richards’ also routinely advises trustees and personal representatives in trust and probate matters ranging from small matters to large, multi-million dollar disputes. Mr. Richards also represents international adoption agencies throughout the country on matters related to Hague-accreditation and other matters pending before the Council on Accreditation. He has successfully helped agencies achieve reaccreditation through creative and collaborative team-work and has helped agencies handle complaints from former clients, employees and state government officials. 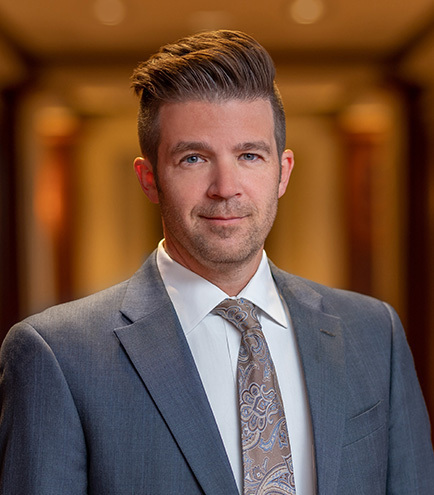 Mr. Richards is recognized as one of Utah's Legal Elite for business litigation and as a Mountain States Super Lawyer for intellectual property litigation. Provides outside general counsel representation for international adoption agencies, including representation of Hague-accredited agencies or agencies seeking Hague-accreditation before the Council on Accreditation. Represents clients in large, multi-million dollar trust disputes as well as smaller-sized trust disputes. Experience with large, multi-million dollar, complex multi-state litigation. Successfully prosecuted a criminal contempt proceeding against clients civil lawsuit opponent. Successfully represented lawyers in Bar disputes before the Utah State Bar Commission. Represented one of China's largest manufacturers of clothing apparel in enforcement of its intellectual property rights. Represents large commercial clients and private individual clients in all areas of business, construction, and real property related litigation. Substantial experience litigating partnership disputes, including actions by a minority shareholder for oppression and breach of fiduciary duty. Experience managing high-volume document production. Obtained favorable settlement for client in lawsuit after successfully dismissing $800,000 contract-based counterclaim on summary judgment. Favorable settlement for client in California lawsuit based on claims of trade secret misappropriation. McBroom v. Child, et al., 2016 UT 38, successfully represented appellee on appeal to Utah Supreme Court related the Estate of R.C. Willey. Kalashnikov v. Salt Lake City, et al., 2016 UT App 213, obtained full dismissal of plaintiff’s claims in the district court and after an appeal by the plaintiff, obtained a full affirmance of the dismissal by the Utah Court of Appeals in a unanimous decision. Prior to joining Kirton & McConkie, spent one year in New York City as an associate with the law firm Davis Polk & Wardwell, advising large, publicly-traded corporations on all aspects of mergers & acquisitions, public debt and equity offerings, derivative debt offerings, tender offers, and other areas of corporate governance. Pro Bono Law Firm of the Year awarded by Utah Chapter of the Federal Bar Association to Kirton & McConkie due to his pro bono efforts. Board Member, Anything For A Friend, Inc.